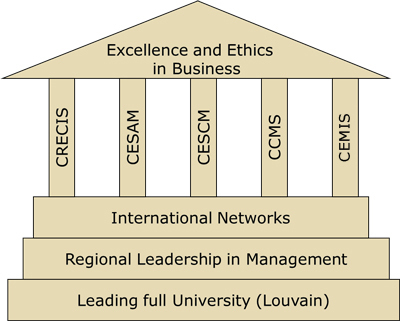 “To create and diffuse knowledge and best practices in the field of responsible management in an enriching and stimulating working environment to the benefit of our main stakeholders, our students, with the ultimate aim of developing the skills and competences that national and international private and public organizations need to thrive in terms of excellence and ethics in business." To guide stakeholders in the practical implementation of the School’s distinctive set of values, in 2009 work began on a so-called “Competency Framework”. Over two years, recent graduates, corporate representatives, faculty members, students and management education experts worked together to define our common objective in terms of the type of people we seek to be and develop. The result was a 9-point diagram of personal and professional traits, arranged in the form of a compass to help show the relationships between them. 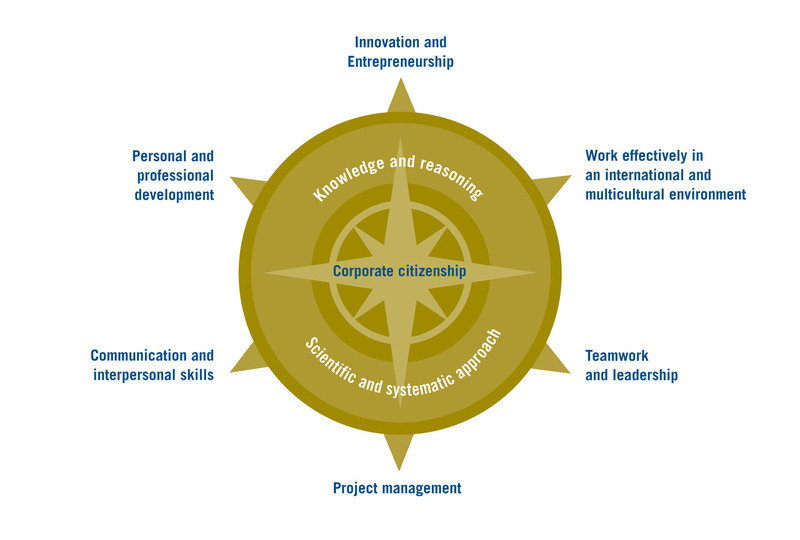 At the centre is “corporate citizenship”, supported immediately by acquisition of “knowledge and reasoning” and commitment to “a scientific and systematic approach”, and at another level, by 6 transversal personal skills and attitudes. Use of the “Competency Framework” began in the previous EQUIS review period with its application for a thorough renewal of the objectives and intended learning outcomes of all the School’s programmes and courses. During the current review period, application of the LSM Compass has been extended as a way to orient all stakeholders regarding our common identity, objectives and attitudes, and as a guide for the overall strategic direction of the School. The foundations are our CEMS and PIM international networks, our regional leadership and our position and brand within a leading comprehensive university (UCL). Our overarching set of core values is "Excellence and Ethics in Business". The values behind the School’s mission and vision are summarised in its slogan of “Excellence and Ethics in Business”. We define “excellence” in terms of scientific rigor, openness to the world and entrepreneurship. Our methods, tools and readings are based on established facts and principles, not ‘fads’ and quick fixes. “Ethics” for us refers to humanism, critical thinking and responsible citizenship – putting the good of individual persons and of society at the centre of decision-making. The ethical dimension emerges in all our actions, in respect for personal experience and diversity, in attention to social and economic sustainability, in dedication to the principles of scientific integrity. These values are very well known to, and shared by, all our stakeholders. They have long shaped the School’s identity and continue bringing together and guiding our academic community. The School invests in its Centers of Excellence which focuses on high-level specialization and quality. We use active teaching methods (role playing, in-company training, international exchanges, numerous professional testimonials, etc.). We stay in close contact with the practical needs of company life, and particularly with the need to work on a project basis and in teams. The School is part of a full university environment that includes all disciplines. Our professors, researchers, and students deal with people working in other domains on a daily basis. They include doctors, psychologists, engineers, chemists, physicists, lawyers, economists, philosophers, etc... A dynamic setting favorable to multidisciplinary exchanges. The School encourages international exposure of students and multiculturalism. We have built a global exchange network of more than 140 universities in 44 countries and on five continents. This internationalization enables many exchanges between professors and students. Our school is a member of the prestigious global CEMS network . The School educates future responsible leaders who will manage people and projects in a global environment. To support the matching between business needs and students’ inspirations and ambitions, the School offers our students a very large panel of opportunities to get considerable feedback from the corporate world. Accordingly, our programmes directly provide numerous opportunities for input from various practitioners as well as practical work, in particular through internships or business projects. Entrepreneurs are the engines of regional development and social and economic progress as well. The goal of the School is to develop the spirit of entrepreneurship, innovation, and initiative. Embedded in the Université Catholique de Louvain, we are part of a long tradition of open-mindedness and humanism. We put equal emphasis on interpersonal skills and "know-how". Our objective is to educate managers who are conscious of their responsibilities. They should follow a set of values that places the business world in its proper perspective in society and seeks to promote sustainable development for the advancement of as many people as possible. Taking the Six Principles of the PRME (www.unprme.org) as a guiding framework, our School is willing to integrate corporate responsibility and sustainability in order to implement the following Principles, starting with those that are more relevant to our mission. Principle 1 - Purpose: We develop the capabilities of students to be future generators of sustainable value for business and society at large and to work for an inclusive and sustainable global economy (competencies framework). Principle 2 - Values: We incorporate into our academic activities and curricula the values of global social responsibility as portrayed in international initiatives such as the United Nations Global Compact (excellence and ethics in business). Principle 3 - Method: We create educational frameworks, materials, processes and environments that enable effective learning experiences for responsible leadership. Principle 4 - Research: We engage in conceptual and empirical research that advances our understanding about the role, dynamics, and impact of corporations in the creation of sustainable social, environmental and economic value (CSR network). Principle 5 - Partnership: We interact with managers of business corporations to extend our knowledge of their challenges in meeting social and environmental responsibilities and to explore jointly effective approaches to meeting these challenges (CEMS network, GRLI network, CSR Europe, …). Principle 6 - Dialogue: We facilitate and support dialogues and debates among educators, students, business, government, consumers, media, civil society organizations and other interested groups and stakeholders on critical issues related to global social responsibility and sustainability (culture of consensus and willingness of representative of stakeholders at different governance levels of the school).